Dimensions: 6.5 x 6.5 x 1.2"
System Requirements: Microsoft Windows 98SE, NT, 2000, XP, Vista or Windows 7, MAC OS, NetWare, UNIX or Linux. Dimensions (W x D x H): 3.2 x 2.1 x 0.9"
Additional 5 Pack of Blucoil Cable Ties to complete your bundle! PLUG-AND-PLAY ACCESS POINT - The Open-Mesh A40 deploys automatic channel configuration, networking, and meshing to extend WIFI signals to dead spots. No need for intricate or confusing configuration, simply plug-and-play. FREE NETWORK MANAGEMENT - The A40 kit comes with a powerful cloud-based network controller. You can build and manage networks without needing to install servers or software. It also comes with CloudTrax app to broadcast multiple unique SSIDs and send automated alerts. DURABLE UNIT FOR INDOORS/OUTDOORS - The A40 Dual Band Access Point is water and dust resistant. It can be mounted on a junction box, solid wall or ceiling, t-rail ceiling, outdoor walls or poles. Conveniently spread an Internet connection throughout your house, apartment, office, retail store or restaurant. TP-LINK TL-PoE150S - This is a reliable plug-and-play PoE Injector, which adds power to your Ethernet cable and enabling access points to be installed on the ceiling without the need for a nearby power outlet. The TL-PoE150S is IEEE 802.3af compliant and delivers power up to 100 meters. 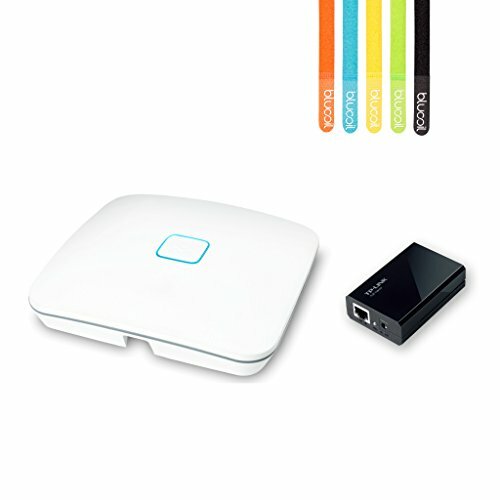 INCLUDES - Open-Mesh A40 Dual-Band 2.4 GHz & 5 GHz Access Point Installation Kit. TP-LINK TL-PoE150S PoE Injector Adapter (100m). (5) Blucoil Cable Ties.